According to government statistics, in the United States there are more than 30,000 motor vehicle accidents that annually claim the lives of motor vehicle drivers. Of these, vehicle rollovers are the most devastating - and scary - types of accidents that can occur. Ever witnessed one? They're more than frightening. Unlike the rollover car accidents that people are exposed to in Hollywood action movies, in which drivers and passengers frequently walk away unscathed, in real life, rollovers are the cause of all types of terrible injuries - and deaths. Add to the equation the fact that there are now more oversized Sport Utility Vehicles (SUVs) on the roads, and you have a manufactured formula for disaster. 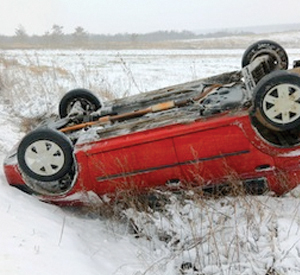 It's a fact - SUVs are particularly prone to rollovers. The Insurance Institute for Highway Safety (IIHS) estimates that fatalities among SUV drivers and occupants have risen annually for more than ten years. Safety studies indicate that more than half of the people who are killed in SUV crashes are involved in rollovers. For car rollover accidents, the percentage is 25%, and for truck rollover accidents, the percentage is 47%. The IIHS has noted that SUV rollovers frequently occur because when a driver loses control of his motor vehicle, it frequently falls to one side more easily than a regular sedan. This has to do with center of gravity issues with SUV's. Two years ago, while driving home from a vacation on Cape Cod, my wife and I witnessed firsthand a car rollover accident on Route 3. It happened right in front of us on the highway - in fact, we were right behind the car that rolled, and we could clearly see the injured driver trapped inside the overturned car, in her seat, as stopped traffic backed up directly behind us. That's an image I will never forget. As a Massachusetts car accident attorney, I want to assure that anyone who suffers from such a terrible accident receives the best legal counsel - and the most financial damages for their injuries -- that he or she deserves. If you or someone you know has been injured in a car/SUVrollover accident, you will need the expert advice of a qualified Boston, Massachusetts car rollover accident attorney such as The Law Offices of William D. Kickham & Associates, with offices in Westwood, Mass., and Boston, Mass. Our motor vehicle accident attorneys are among the best in the state, with the proven case results to show it. It is estimated that slightly more than 15% of the fatal crashes that occur annually in Massachusetts, include vehicle rollovers. Here is yet another astounding fact: More than 60% of individuals who actually die in rollover collisions are thrown from their vehicle. Due to rollovers, head and brain injuries are also commonplace. Neck and other musculoskeletal injuries also can be a result of rollovers, especially when vehicle occupants are not wearing their seat belt, or when seat belts fail and drivers and passengers are thrown from the motor vehicle. If you need a visual image of what happens to vehicle occupants who are not wearing seat belts in a rollover accident, imagine what happens to a doll or stuffed animal in a clothes dryer. Enough said. If you or someone you care about has been involved in a Massachusetts rollover accident, or Massachusetts car accident, we have prepared a FREE, VALUABLE article about the first steps you should take - as well as not take - following an accident or injury in Massachusetts. This FREE article, "The Top Ten Things To Do After Suffering An Injury or Accident In Massachusetts", contains valuable information about the steps you need to take in the aftermath of a rollover car accident. You'll discover things you would not ordinarily know, about how to protect yourself after a car/SUV rollover accident, when you have suffered a personal injury, and how to proceed in the days following such an accident. We have worked with countless Massachusetts car accident victims, and are experienced in how to recover the financial damages that car rollover accident victims deserve. Check out our case results by clicking here. Please bear in mind - we will travel to home or hospital to assist you with your legal case, and you pay absolutely NO FEES unless we win your case. You owe it to yourself to contact us at (781) 320-0062 or (617) 285-3600. You can also email us confidentially. Westwood and Boston, Massachusetts injury lawyer William D. Kickham frequently appears as a legal analyst and commentator on a variety of prestigious media, which include Court TV (now In Session on HLN,) Fox News TV-25/Boston, The Boston Herald, WBZ-AM Radio 1030, WCVB-TV5/Boston, Nightside With Dan Rea, Greater Boston With Emily Rooney, Money Matters Radio/Boston, and The Metro Newspaper/ Boston. Attorney William D. Kickham is turned to by respected reporters and media in Massachusetts because he is an authoritative expert in the field of Massachusetts personal injury law.